In Darwin’s Doubt, Stephen C. Meyer tells the story of the mystery surrounding this explosion of animal life—a mystery that has intensified, not only because the expected ancestors of these animals have not been found, but because scientists have learned more about what it takes to construct an animal. During the last half century, biologists have come to appreciate the central importance of biological information—stored in DNA and elsewhere in cells—to building animal forms. 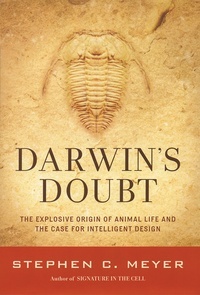 Expanding on the compelling case he presented in his last book, Signature in the Cell, Meyer argues that the origin of this information, as well as other mysterious features of the Cambrian event, are best explained by intelligent design, rather than purely undirected evolutionary processes.